In January 2014, we decided to launch the Housing First model in Arrels Foundation. To achieve this, we changed our ways of working, and the way we trained professionals and the volunteering team. At the same time, we had to merge our teams. Before we started to apply the Housing First model, there were two different teams that helped the client. On the one hand, the Social Work team made up of social workers, who were in charge of the client’s social and administrative needs. On the other hand, there was the Housing Support team, made up of social educators and community support workers, who worked to make sure that the client was as independent as possible within their home. Today, these two teams no longer exist, they have merged into one unit, called Support to the Person. This unit is divided into three working teams made up of four or five professionals with complementary profiles and with the support of a volunteering team. “The main change is the flexibility accomplished by this new team,” says Ester Sánchez, who is responsible for the Support to the Person team. “The professionals’ roles, for instance, have been mixed. Before the change, a social worker was in charge of case management, the procedures, the interviews with the client, etc., but now they also are working as educators and community support workers. And it also works the other way around: if the client living in an apartment needs help to have a shower, for example, it is given whether the team member is a social worker, a community support worker or an educator. This change in the way of working has also meant a difference for our clients, because they have gone from having an individual relationship with one case worker to having one with a team in which all the members are their case workers. And furthermore: before, the homeless people linked to Arrels Foundation who accessed housing did so after establishing a bond with the open centre of the Foundation. Now, with the Housing First model, people who live on the street and have been visited by Arrels’ outreach team, but who will only sometimes or even never visit the centre, have the opportunity to access stable housing without the need to go through the whole process. Two and a half years after starting to implement the Housing First model in the Arrels Foundation, the changes continue. In May 2016, the entity offered shelter to 162 homeless people, of which 49 had individual housing. The number of people living in shared apartments is similar to the one in 2014 but, the number of people who now live in a rented apartment has gone from 52 to 34. All people housed, wherever they live, receive case management based on Housing First and the stability of the housing has increased considerably. To know if we were applying the Housing First correctly, in June 2016 the Support to the Person team carried out a survey that examined the fidelity to the original model, one which is used in other countries in which this model of care for homeless people is promoted. The assessment examined the housing and requirements process, the follow-up made to the client, the opportunities in case the housing is lost, the kind of services offered, the economic contributions that people have to make, help with housing received and team structures. There were about 40 indicators in total, and the maximum punctuation accomplished meant a 100% of fidelity. Arrels Foundation’s survey resulted in a 72% degree of fidelity. We have a lot of challenges. Some of them are out of our hands and are related to the difficulty of the social and political context in which we live. For example, high housing prices or the difficulties in ensuring people have a stable enough income, either through occupation and jobs adapted to their reality or through granted social benefits. Reinforce the teams with peers. 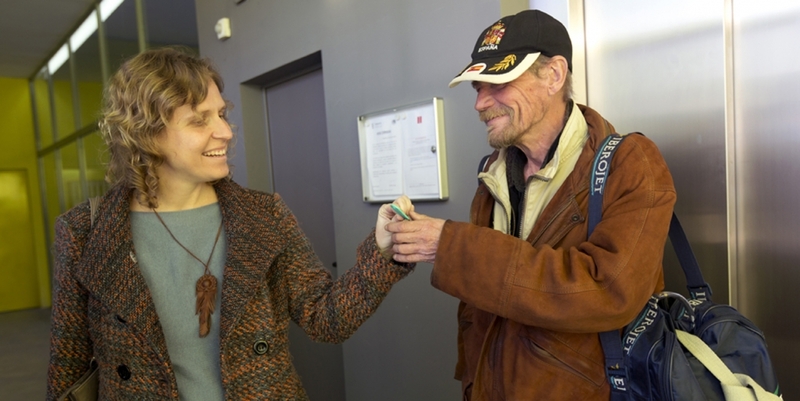 In other European cities where Housing First is implemented, the teams in charge of case management are helped by people who have lived on the streets and who bring their expertise. In the process we have launched in Arrels, this is still a continuing challenge and one that we need to know more about. Today, several people who know what sleeping rough means are collaborators and help with one-off accompaniments, such as a visit to the doctor. Face the loneliness. When a person lives on the streets, they break, sometimes almost completely, the majority of the social links they had. One of the most critical efforts they have to make when they leave the streets is to create a new social network and to confront loneliness. When someone lives in an apartment by themselves, this solitude is very present, and we have to think about how to deal with this so that they have options that go further than staying at home watching TV or coming to the Arrels day centre. Make a suitable accompaniment to couples who access an apartment with the Housing model. Sometimes a person obtains an individual apartment and is quickly joined by their companion. We respect their decision because they decide what to do with their lives, and the flat is their home. The difficulty appears when there are problems with the couple, mostly linked to solitude and lack of respect, and when the housing management is carried out by Arrels. Finding individual housing at an affordable price. Nowadays, Arrels offers accommodation located in Barcelona, Cornellà, Granollers and l’Hospitalet de Llobregat. Finding small apartments for less than 500€ is turning out to be impossible due to the real estate market situation. In these two and a half years of implementing Housing First and searching for individual housing, we have encountered reluctant owners, wary that their house would be used by someone who has lived on the streets. Prevent a person from going back to the streets in the case of losing their housing. At Arrels we believe that individual housing is an excellent solution for the chronic homeless who have tried to live in other types of accommodation, such as pension rooms or shared apartments. Sometimes, however, problems with neighbours (to keep some basic rules of coexistence is one of the three requirements of the Housing First model) causes the person to leave the housing. The challenge is to find new housing solutions, intermediate resources that we do not have or know about, that could prevent this person from going back to the streets. All of these challenges add up to the sixth one of equal importance we are worried about: what happens with the percentage of people who live on the streets and who tell us they do not want a dignified and stable housing?. We have already encountered this situation before, mostly with people who suffer mental health problems, and we should know how to face it. Maybe in those cases, the solution isn’t individual housing, and we should be more imaginative. But we can still try to attend the people by following the principles of Housing First intervention model, thus respecting their decisions as much as possible.